South Korea launched a government-civilian team Monday to promote cultural and social ties with Japan despite decades of disputes between the neighboring countries over historical issues. The move reflects Seoul's efforts to expand non-political exchanges with Tokyo separately from the diplomatic stand-offs over its wartime atrocities and territorial claims. 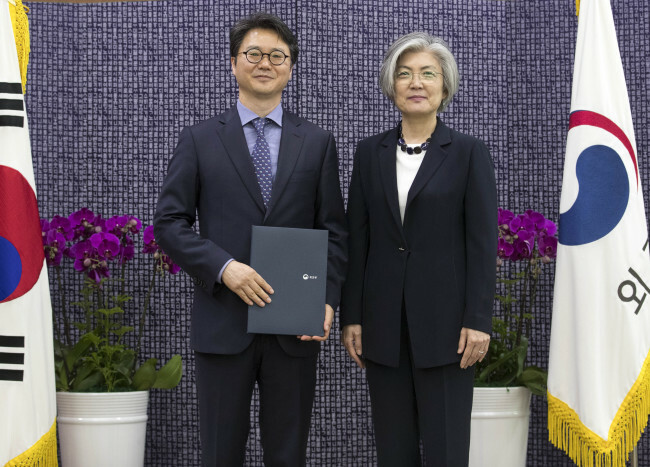 Speaking at a related ceremony here, Foreign Minister Kang Kyung-wha reaffirmed the government's two-track approach, saying the bilateral relationship has been "very stagnant" in recent years. She cited the need to promote "people-to-people, cultural exchanges between the two countries, while (the South Korean government) continues to deal with issues related to our history with principle." The minister noted that 2018 marks the 20th anniversary of the historic declaration by South Korean President Kim Dae-jung and Japanese Prime Minister Keizo Obuchi on building a new, future-oriented partnership between the two sides. In the joint statement, Obuchi expressed "keen remorse and apologized for the historical fact that Japan, through its past colonial rule of the Korean Peninsula, imposed great damage and pain on the South Korean people."